Ads by Brown Bark might start appearing on your screen if brown bark application, which is published by an infamous Super Web LLC company, slithers onto your computer without your permission. Unfortunately, the program is compatible with all the browsers, including Internet Explorer, Google Chrome, and Mozilla Firefox; thus, you will not be able to avoid these ads if the aforementioned advertising-supported application enters your system. If you are already seeing Ads by Brown Bark, it is an indication that you have to detect adware and then delete it without mercy. Luckily, it is not a difficult task to remove brown bark; however, it might be rather difficult to detect it because it tends to hide on the system. It does not matter whether you see ads with a label Ads by Brown Bark or Powered by brown bark because it is still not advisable to click on any of them because they might take you to the websites that contain malicious software. It has been found out that malware might enter your system very quickly, which is why you should be very cautious. The first thing that you have to do in order to prevent infections from entering your system is to delete brown bark entirely. In addition, you should never click on various ads that you might come across while browsing the web. Finally, it is advisable to find out whether the program is reliable prior the installation and you should not forget to install an antimalware tool and keep it enabled. 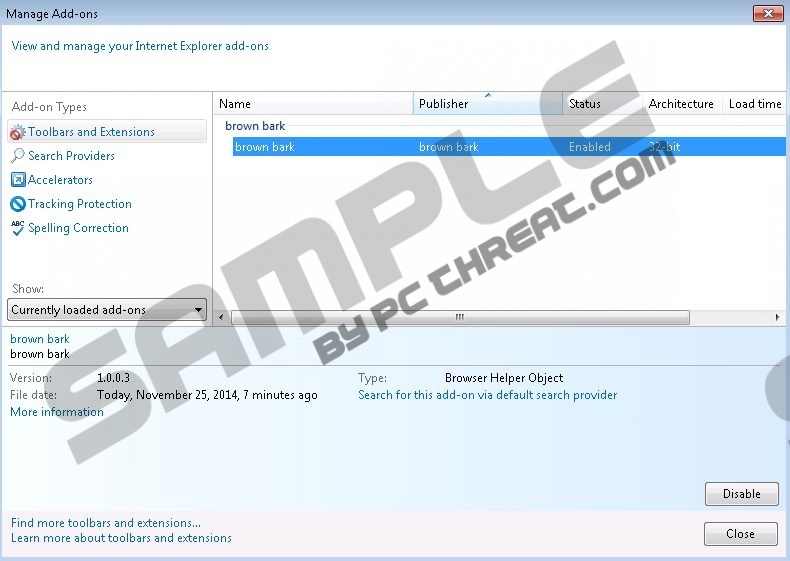 The researchers of pcthreat.com have tested brown bark and found out that it will not only show Ads by Brown Bark, but also might do other undesirable activities behind your back, e.g. connect to the internet without your permission. Unfortunately, the majority of Super Web LLC products act in a similar manner, which is why you should protect your system in order not to encounter MossNet, Cling-Clang, Albrechto, Surftatic, and other applications. As brown bark, they travel bundled with unrelated programs and might enter your PC without your permission. Actually, it does not seem that you will be able to download any of them from their official websites because the download link is broken on all of them. Do you want to stop Ads by Brown Bark from appearing? If so, you will have to delete brown bark adware program entirely. As the program can be eliminated via Control Panel, it will not be difficult to get rid of it. However, if you need some help, you should follow the instructions provided below the article. Keep in mind that you can leave your question associated with the removal of brown bark in the comment box below the article as well and we will answer you as soon as possible. Click the Start button and access Control Panel. Find the suspicious software, select it, and then click Remove. Locate brown bark on the list. Find the application that you want to remove on the list. Click Uninstall. Quick & tested solution for Ads by Brown Bark removal.